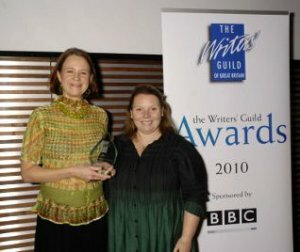 A little belated, but congrats to Jo Brand, Joanna Scanlan and Vicki Pepperdine, who won “Best Television Comedy” at the Writers’ Guild Awards, for Getting On. Hurrah! Apparently the ceremony was last Monday, and I normally do my news-trawl on a Sunday, so… sorry about that. This entry was posted in Rants about TV and tagged Getting On, Joanna Scanlan, Vicki Pepperdine. Bookmark the permalink.